Kenzy is using Smore newsletters to spread the word online. You might be wondering what transition words are. Transition words are words that you use to go from one idea to a different idea, and make the paragraphs flow together. Transitions almost ALWAYS have commas after them. When do I use a transition word? You use a transition word when you are beginning a new a new paragraph or topic. Where in the paragraph do I use a transition word? 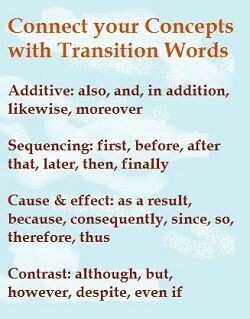 You use a transition word in normally the first few words of a paragraph. Now you know what transition words are, where to use them, and when to use them. The only things left to learn are the words to use when transitioning. When you are transitioning, you should use words like...also, in addition, not only, on the other hand, not to mention, and many more. Here's an example: In addition, child labor is responsible for many deaths. My transition words are "In addition" and those words have a comma after them, and then, I stated my fact. My transition was only 2 words, and normally, transition words range from about one to five words. Still don't understand transitions? Watch this video!